I'm ready for a giveaway ~ Are you? Great! You all are amazing. As a way of saying, "Thank You," I want to give YOU this awesome kitchen tool! Have a picky eater in your family? Use this to blend away all the "chunkies!" Stick this into a HOT pot of sauce and use it...no transferring hot liquids to a blender! Push this button and the attachment comes off...and yes, the blade can go in the dishwasher! Woot! This even comes with a 2 cup plastic beaker that makes dressings and homemade mayo a cinch! Of course, if you want to use it for chocolate milk, you can. It'll bring out the kid in ya. Want one? Of course you do! Have one? Well, win this and give it away as a wedding gift! Okay, now that I've got you all psyched up, here's what you gotta do. Leave a comment on THIS post. Any comment. The first thing that comes to your mind. If your profile doesn't include an email, please, pretty please, include it in your comment(s) so I can contact you if you win! You can leave ONE comment PER DAY... just come back to this post and enter! Cool, huh? It will increase your chances of winning! Contest is open to my U.S. readers only and will end at midnight MST on Friday, May 20th, 2011. This giveaway is not sponsored by anyone but me, yours truly. UPDATE: Blogger was down for part of May 11 and all of May 12 and lost EVERY single comment that was posted that day. I retrieved all the comments from my email and posted them myself, hence the highlighted green comments from "me." I felt that each person who lost a comment to Blogger deserved to have his/her entry count. Oooh the things I can make! Thanks! Hmmmm, How about, "I want that blender!" I miss mine so much, after it died after about ten years of abuse, whoops, I meant use! It was used for EVERYTHING. I even used it to make home made soap! I would love to have one of these for my grandson so he can make individual smoothies. He has no blender! I love the detachable stem on these, so the working end can go in the dishwasher! Love the red color! 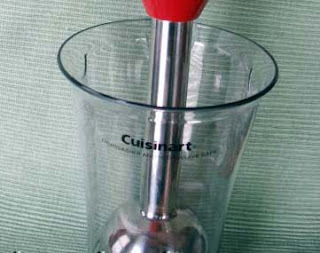 This would be great for blending soups for my "I don't eat things that are chunky" 5-year-old. We use our immersion blender almost every day to whip up our protein drinks. I would love for my hubby to have one to use at work too! I love my immersion blender too. My nephew is getting married and this would be a great gift! Whee! One of those is on my wish list! i love that it can go in the dishwasher! I love you blog! thanks for the givaway...this looks like a handy kitchen tool! I want to be an immersion blender!! WHOO HOO that is cool! Awesome! I have one, but I bought it at Goodwill, it's old, and it's not very effective. I love these things for making pureed veggie soups. Oh my word..I immediately thought of Margarita's..LOL. Amazing! I have wanted on of these for a while but have been putting it off until my kitchen remodel is complete - sign me up! 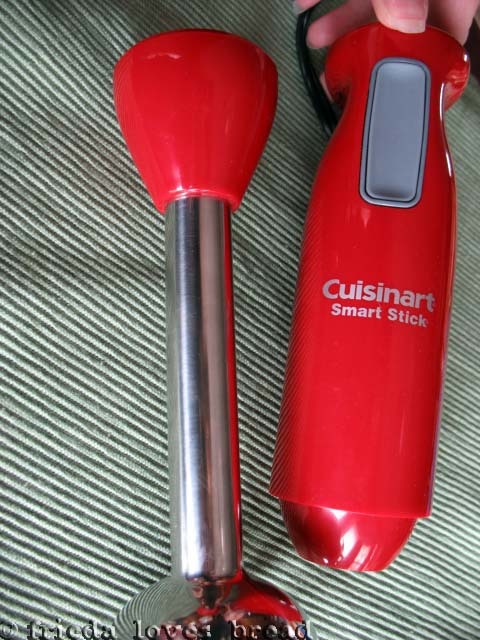 I had an "old clunker" immersion blender several years ago.... but it died. I'd love a new one! I would love it! Thank you. Thank you!! Love these stick blenders. I could use another. Thanks for the great giveaway. Not having to clean every aspect of my food processor would be fabulous! 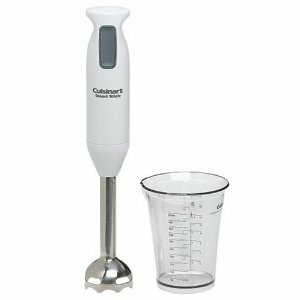 I have wanted an immersion blender for a long time, but haven't been able to justify spending the money. The kid is out in me all the time since I absolutely LOVE chocolate milk! Or maybe it is literally the kid inside of me... my baby must love the chocolate! I would love to win this! What a great item for my nephews to have a shake or smoothie. They love "helping" in the kitchen and this would be right for them with supervision. I have wanted one forever! I could really use a new one, my old one is almost dead. Yeah! I want one! Just posted a link to your blog for your Crispy Tater Babies on my Cooking With Kick facebook page and was checking to make sure it worked and viola a giveaway! Sounds like you really like it. One of these have been on my wish list for a while now. Great giveaway! I am salivating at the though of winning this blender! Love your site! Would love an immersion blender ALMOST as much!!! 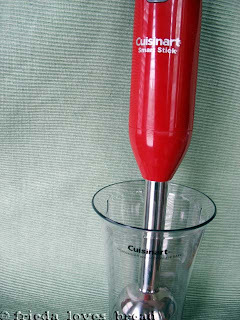 An immersion blender would be a fun thing to play with, though I've no idea what I'd first make with it. How 'bout tagging some recipes based on gadgets? I love my immersion blender -- bought it at a garage sale of all places. Would love to have a new one! I love seeing your updates in my email. Your recipes are wonderful. Thanks for the giveaway. Love this tool, especially in RED! this is so cool!!! must have! How wonderful, how great of you to do this. Love this, great give away! And...comments are back up...I wonder if google thought they could take their site down for maintenance in the wee hours of the morning when no one would notice....There were a lot of other blogger blogs down this morning. too. This has to be one of the handiest kitchen tools ever! I can think of lots of uses for it since I'm a cook & a baker! I am holding out hope that it's me that wins this! I have always wanted to try oneo of these things. Pick ME! Oh wow, I could do such amazing things with this, I have never had one before! I've never used one. I didn't realize it could be used to make so many different goodies. Love the idea of making homemade mayo and dressings. Immersion blenders are so cool! This looks great. It'd be nice not to have to lug the blender down from the top shelf to enjoy a quick smoothie. Where did all the other comments go? It's only showing 18. I know there were at least 70 yesterday. I've been waiting all morning to post my entry for today. Glad Blogger's finally back up. I love bread too :) and I've always wanted one of those but I've been too ... nervous? stingy? out of space? Here is my second entry for the day!! I could have used this to make my little individual quiches for breakfast this morning. It would have really come in handy! If my comment was one that was deleted from yesterday, then this is my 2nd one for today! You know, there isn't a pic that you put up of what you've made that I haven't wanted to try too! You must be baking every day of the week! I LOVE these! Crossing my fingers! And do I get to post twice today because of blogger? If so, here it is! SO cool. I have always wanted one, I have a few soup recipes that it would greatly help. What a great giveaway!! Ahhh I have been wanting one of these! I want one please so cool! this is hopefully my second one for today didn't see the other yet. This is post #1 for today! I'm sorry that posts got lost, but I'm excited that I get to post again. Still love the red color - I'm thinking smoothies would be awesome with this. I need one for one of my daughters..she is a health fitness fanatic and this would be great for her and her hubby's veggie drinks. Post #2. Smoothies would be good, but I wonder if I could use it to make Ree's salsa too? Bonus entry for today since blogger erased our comments from yesterday. this looks great. would love to have one! I'll take my second entry for the day; thanks! I know they are still working on retrieving the posts that were deleted yesterday; maybe the comments will reappear then too. 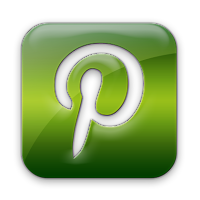 My blog is still missing yesterday's post and I gave up on doing a post today a long time ago! How cool that you are sponsoring this amazing giveaway! Guess that's fitting since you seem to be one amazing lady... love your blog! I'm thinking it would even make bubbles in a bubble bath! I think this would help making home made baby food!! As I said last time, I'm amazed at how many uses you've found for this. I'd love to try one out! ack! I don't remember what I said in my previous post. Thank you so much for your love of bread making. I have learned so much digging through your recipes and tips. This weekend I am going to make your enchilada sauce. I can't wait! Such a great giveaway! I'd love one...all the things I could make!! 2Sammie How wonderful, how great of you to do this. How cool!! 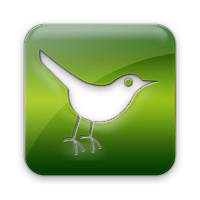 Great site, thanks for invite to visit! I have always wanted to try one of these things. Pick ME! oh my gosh! My very old immmersion blender is dying and therefore I need a new one! I hope I win this one!! :)oh my gosh! I think I need more kitchen tools. I wanted this for my grandson to make his smoothies but now I see that since I have the chili pepper theme going on in my kitchen, I might need this to match all the red. He'll just have to come over here for a smoothie! Wow! your awesome! I am surprised that you had them all! good for you! Can't wait to find out who won! My entry for today. Thanks for doing the giveaway! I've never used an immersion blender, but I'd love to start! Awesome site and giveaway! Another entry :) I'm glad you were able to retrieve your comments. I can just imagine a heart sinking feeling you must have had! Almost forgot to make my entry for the day! Here is my entry for today! I had one of these once - it was awesome! Pick me, random number generator! Great giveaway! 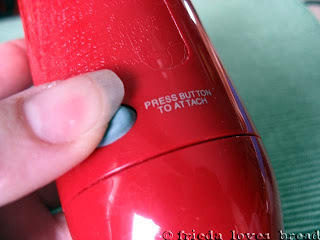 I've always wanted to use one of these! Thanks for the chance to win this Frieda! This kitchen gadget may be small but I bet it can be used a lot of different ways! I'd like the chance to find that out! love this, mine is old but I still love it! That Blogger hiccup on May 11th really chewed into my blogging rhythm...I took Thursday and Friday off from blogging...it was nice. I have lots to catch up on this week. Thanks for doing your best to post entries for the giveaway. Love the red color. I just found your blog and bookmarked it. The recipes look wonderful. I am definitely going to try the hamburger buns. Yep, I'm still here. Still want it! I'm getting the urge to bake some more bread but think I want to try one of your recipes this time. My mom was a bread baker......baked fresh bread every Saturday of my growing up life! I can't believe you went through and posted all those comments! Your great! Just found your blog and the sable cookies...yum! 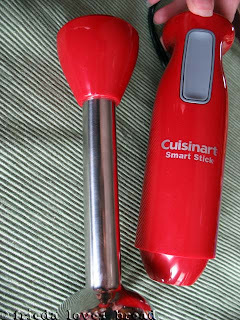 Would love to win an immersion blender. Wanted to make some soups recently but the thought of hauling out my blender and whizzing portions at a time just killed the idea. Was just reading immersion blender reviews and had decided to get this when I get some $. I'd love to give it a try and so would my kids! Kind of cold today; a pureed veggie soup sounds good for lunch! Not only would this kitchen gadget come in handy, but it matches the color decor in my kitchen! I've been wanting one of these for soups!! nisha (dot) riggs (at) gmail (dot) com.